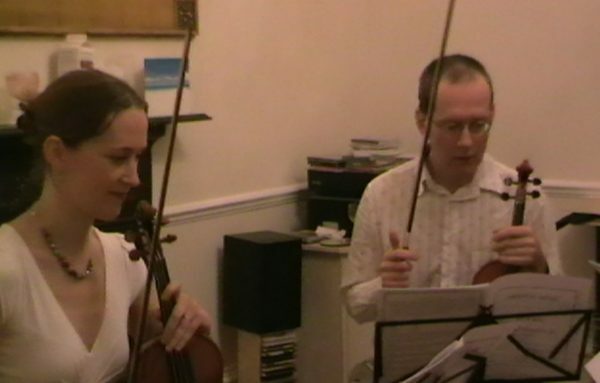 Rehearsing a String Quartet – Chamber Music – Apart from its popular themed classical string quartet concerts, the Manor House String Quartet also gives recitals of more substantial works too. One of these took place at the Leighton Buzzard Music Club and can be read about here. I try and get all four parts bowed before the first rehearsal, with consistent bowings that are the same when instruments share similar music. Some may subsequently be changed and will naturally evolve as all the players reach a unity of purpose, but at least time won‚Äôt be wasted in bowing parts ‚Äòfrom scratch‚Äô. We Agree that a pianissimo really is a pianissimo. A big time-waster in rehearsals is constantly stopping to try and get players to play quietly. If all the players agree to this at the start and stick to it, then it will help in creating a unified sound. Often, particularly when rehearsing in domestic settings, the natural acoustics of the room will favour certain instruments, so it‚Äôs best to be aware that balance issues may change when you turn up to the venue to perform the concert. The internal metronome. When all four players have a highly developed sense of the rhythmic pulse, very often their own internal metronome will ensure that the music remains rhythmically ‚Äòon track‚Äô, without the need to constantly adjust to the other players’ pulse. In advance, we agree on tempi which naturally allow the music to open out and breathe. It‚Äôs often significant how much difference this can make and how much easier a movement can flow when the tempo set reflects the true qualities of the written notes. I often feel that it‚Äôs all about finding space in music, and that (to quote Claude Debussy), ‚ÄòMusic is the space between the notes.‚Äô It is the ‚Äòswing‚Äô between one rhythmic pulse and the next which is almost more important than the pulse itself. So when we are able to capture the right ‚Äòfeel‚Äô together, suddenly the music seems easier to play. We try and discipline ourselves not to ‚Äòsolo‚Äô, ie. to compete with the others when you think there is a passage that will make you ‚Äòshine‚Äô. That is all about the personal ego and its desire to be appreciated and this can do nothing but get in the way of the music itself! If a composer has adjudged a passage to be mezzo piano, it is not for us to play it mezzo forte because we want to be heard. Any quartet is simply a vessel for the music with no importance of itself. Once it starts to direct attention to itself and away from the composer‚Äôs music, it ceases to be of much interest, acting as a barrier between composer and audience. Balance. I remember watching a documentary on the Amadeus Quartet and the cellist Martin Lovett was trying to pinpoint what the ‚ÄòAmadeus‚Äô sound was. He replied that ‚Äò‚Ä¶people are always amazed that we sound like one, but from the individual player‚Äôs point of view it means listening to the others, preferably more than to himself, so he is constantly, imperceptibly adjusting to tiny little differences so that it gives the impression of one mind.‚Äô Aspiring to sound like the Amadeus Quartet is a wonderful aspiration to have, even if the end result falls far below this! We try and ‘master’ our parts before coming into the first rehearsal. Or the complete opposite…making sure that none of us have looked at the music at all, so that we can evolve with the music together. I must admit, I do prefer the first option as I believe that a small yet concentrated rehearsal time can lead to a very fulfilling performance!